After a promising pilot, the fate of a show can go either way, whether it be soaring through high ratings and fan praise or crashing hard into cancellation and obscurity. 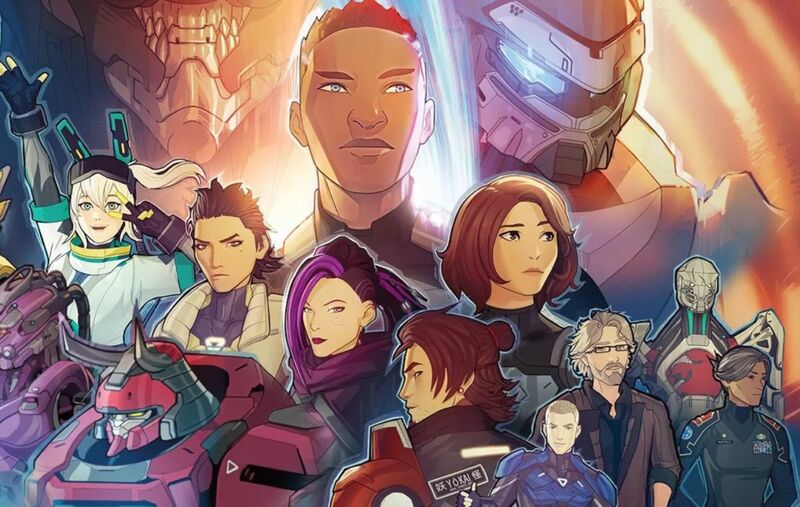 For gen:LOCK, though it’s still early days, the former seems to be the most likely path with another strong instalment from Rooster Teeth in the second episode, ‘There’s Always Tomorrow’. The episode follows straight on from the pilot. In the assembly hall, Dr Weller explains to Chase’s comrades that he is still alive because of the demanding requirements of gen:LOCK, his genetic code was too perfect to waste, so they recovered him straight after the crash (Weller also later adds his experience as a pilot was a huge positive). He then goes into how the mechas, called Holons, are unlike drones or walkers because instead of having a cockpit built in or being controlled remotely from a console, the pilot’s brains are linked up to the machine where they can control it almost telepathically. However, much of the assembly remain unconvinced about Chase, convinced that it’s just an AI based off of him. However, Chase’s friend Miguel Garza (Miles Luna) asks the other gen:LOCK pilot Yasamin Madrani (Golshifteh Farahani) to take her to him. He finds Chase in a wounded state being kept alive by a life support system, Miguel joking that Chase ‘lost weight’. After a touching reunion and some further exposition from Dr Weller about what happened at New York and how the Holons work, Miguel leaves, but not before being promoted to the Holon’s chief mechanic. The episode cuts to the other members of the gen:LOCK program arriving at the base: Kazu Lida from the Japanese Military (Koichi Yamadera), Cameron ‘Cammie’ MacCloud, a seventeen year old Scottish hacker (Maisie Williams), retired Ukrainian special forces Senior Sergeant Valentina Romanyszyn (Asia Kate Dillon) and Specialist Robert Sinclair (Blaine Gibson). However, their introduction to the base is short lived as it turns out Sinclair is a Vanguard spy. As a way to promote the show, some publications got to see the unfinished version of ‘There’s Always Tomorrow’ ahead of public release. It really is amazing to see the stages between a work in progress and the final product, from the simple boxes and surfaces being replaced with the show’s beautiful coloured and detailed environments, and small floating balls acting as placeholders for the visually complex nanomachines. It’s a real testament to show how much effort the creators put into this project. The show also takes inspiration again from other existing products: Chase floating in the tank feels very reminiscent of Luke Skywalker in the bacta tank in The Empire Strikes Back. Again, much like the previous episode, ‘There’s Always Tomorrow’ is more than just a random statement, and relates more to the theme of beginning again. Though it’s a joke throughout how things can only get worse tomorrow, with Weller getting captured, it is also symbolically related to how the characters react to the discovery of Chase being alive: when Miguel finds Chase’s disfigured body floating in the tank and learns that he may never be able to leave it again, he is still happy that his friend is alive and they even make jokes about it as well as plans to catch up. Miranda is angry and refuses to speak to Chase’s hologram, but still thinks about seeing him and only when she sees him in his true state does she feels regretful. The writing in this show is great, in particular through the moments of emotion and comedy. The bitter argument between Chase and Miranda is painful when you realize one of the reasons he went through with it was a chance to see his friends and Miranda again, with Miranda coldly shutting him down. David Tennant, who is well known as portraying the tenth iteration of The Doctor in the Doctor Who series, is no stranger to witty writing and his character just shines throughout. The hostage lift scene is the best example: even with Sinclair holding a gun to his head, Weller is still hilarious. A small detail to note is the name of Weller’s robot: Caliban. Caliban is the name of Prospero’s servant in the Shakespearian play The Tempest, where he is often referred to as a monster and plots to kill his master in the play. Keeping that in mind, what does that mean for the faithful robot assistant? Is Weller just a big fan of Shakespeare, or is this a symbolic hint from the writers that the robot won’t stay a good guy forever? The only real discrepancy that can be noted with the show is minor but still needs to be mentioned, and that is the delicate subject of representation. Despite being set in America and featuring predominantly American characters, there are different nationalities that pop up, and they for the most part are portrayed by actors of these nationalities: Japanese voice acting heavyweight Koichi Yamadera voices a transfer from the Japanese Military, Iranian actress Golshifteh Farahani is a former Iranian fighter pilot, Monica Rial is of Spanish heritage and voices the Puerto Rican Raquel Marin, and Rooster Teeth writer Miles Luna, Texan-born but of Mexican heritage, playing Miguel Garza. Compare this to English actress Maisie Williams playing a Scottish character, and Asia Kate Dillon, an American actor doing a Ukranian character. For a show that works so hard on proper diversity and representation, why skip out on these two roles? Was there not anyone else of matching nationality and acting quality that suited the roles? However, despite all this, both Asia and Maisie are exceptionally talented individuals with a lot of experience under their belts and do the roles justice, nailing accents which are hard to respectfully articulate. As Gray Haddock and Rooster Teeth’s creation slowly progresses with consistently strong episodes, it is clear to see that the production company have learned what they could from previous projects and applied it to make something which could turn out to be their crowning achievement, if they continue to release episodes of the same quality of writing and planning as the first two episodes. ‘There’s Always Tomorrow’ is a great how-to for a follow up to a pilot – a balance of story progression and existing character development, character introduction, and just a bit of intense action to add to the mix.